Cook the No Name Bacon according to package directions. Prepare 1 hardboiled egg. Let the egg cool and then cut into chunks. Put the chopped greens on the plate. Cut the cooked bacon in to chunks and place them in a long strip down the center of the salad. On one side of the salad put the tomatoes and the eggs. On the other side of the salad put the cucumbers and the feta cheese. Sprinkle the salad with the fresh herbs and the croutons. 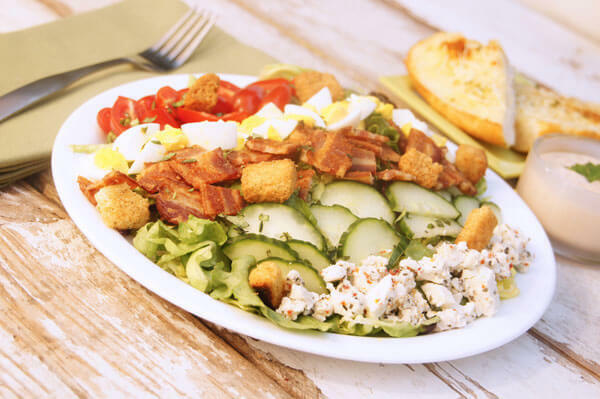 Serve the salad with the Hickory Bacon and Onion Dressing.